Activated Carbon Filtration | TV Adsorber | General Carbon Corp. The Transportable Vapor Phase adsorbers are fabricated from mild steel and are tested to DOT shipping standards. All units have two part epoxy coatings on the inside and industrial enamel on the outside to give a long service life. Inlet/outlet fittings are connected to PVC internals for corrosion resistance. The units have 4-way forklift access, a screened drain and 16-inch top manhole. GC C-40 pelletized virgin, bituminous coal base, carbon is standard. Other virgin coal, coconut shell, reactivated or impregnated carbons are available. Note: Compare inlet/outlet sizes to your flow rate and system duct sizes to make sure your fan has enough static pressure available to produce the design flow rate. *Optional size – must be ordered from factory. Other sizes available. Installation and Startup – TV Series adsorbers require no special procedure for startup. Remove the shipping plugs from the inlet and outlet and make the proper connections to your system. The unit is now ready for service and can be started up. Unions or quick connect fittings are recommended if the unit will be disconnected frequently. Multiple units can be connected in parallel to increase the treated air flow. Testing after a unit is the only way to determine when the carbon is spent. Maintenance – When in use, the only maintenance the TV Units require is testing for contaminants in the influent and effluent streams, and checking the operating pressure of the system. Monitoring the contaminant concentration level into the last unit in a series arrangement is the recommended safeguard against having breakthrough in the final outflow. When the concentration of contaminants in the flow coming out of the lead unit equals the concentration of the flow into the unit, the unit has reached its removal capacity and should be removed from service. The working life of each adsorber is dependent upon the type of contaminant in the air as well as its concentration and the air flow rate. A pressure relief device is advised to prevent damage to the adsorber in the event of excessive pressure buildup. Recharging – Once the carbon is saturated by contaminants, the unit should be taken off line. If connected in a series mode, the next downstream unit should be moved into the lead position and a fresh unit put at the end of the train. All shipping plugs must be replaced when the unit is to be transported. 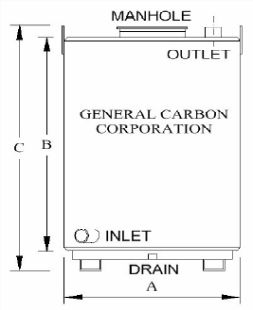 General Carbon has modern equipment and OSHA trained technicians to service your carbon adsorbers. Please call us at 973-523-2223 to get a free service price quote.